Celebrate with the Carson Family this Holiday Season! Would you like to spend less time in the kitchen, and more time with your loved ones on the holidays? To help you and your family enjoy holiday celebrating to the fullest, our team at Carson’s has created a variety of holiday buffets and holiday menu packages at an affordable price! From Carson’s infamous main course dishes, to unforgettable dessert options, you are sure to enjoy yourself during our premier holiday buffets. Celebrate with us on Easter Sunday, Mother’s Day, Father’s Day, Thanksgiving and New Year’s Eve! 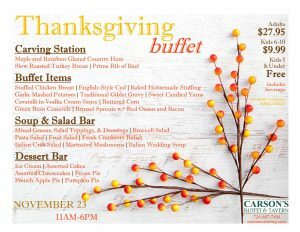 Carson’s welcomes your family and friends to gather and join us for our specialty holiday buffet celebrations. Enjoy your holidays without the hassles of extensive cooking or hefty clean up work. At Carson’s, we believe that holidays represent a special reason to celebrate with good food, family and friends. That’s why we make sure that each one of our annual holiday buffet selections yield fun times, delicious recipes, and quality services year after year. Start a new holiday tradition, or continue an old one with us at Carson’s. 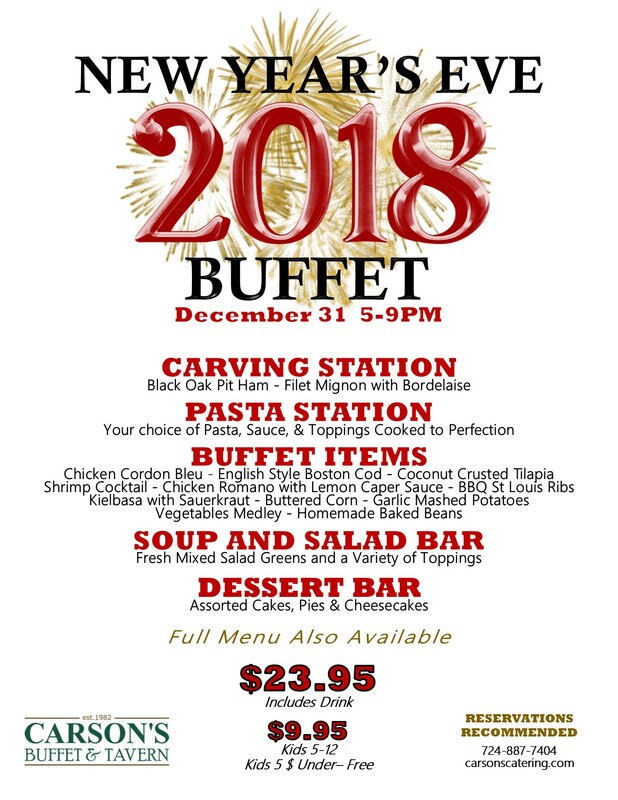 Contact Carson’s for additional information on our one-of-a-kind holiday buffets and holiday menu packages (from hors d’oeuvres and dessert, to full sit down dinner options), or make online reservations now to guarantee you and your family a place later!